University of Delaware researcher Jason Gleghorn, assistant professor of biomedical engineering, is studying lung development. 3:15 p.m., May 20, 2015--The first sounds of life – that sputtering, wailing cry of a newborn whose lungs have just filled with air for the first time – are a triumphant signal that a long chain of tiny developments has gone wonderfully right. 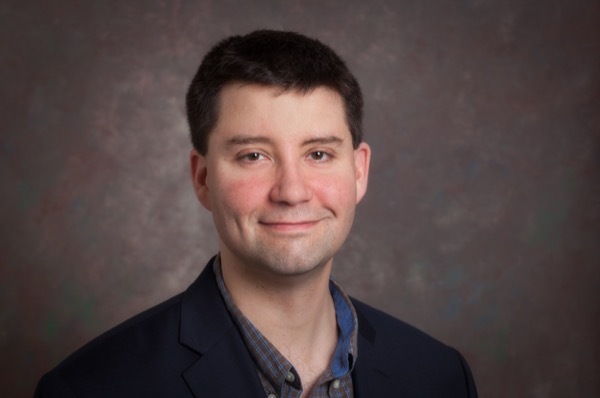 How those little lungs emerge with the capacity to sustain life is the focus of study by University of Delaware researcher Jason Gleghorn, assistant professor of biomedical engineering. Specifically, Gleghorn is studying the relationship of certain protein patterns, contractions of smooth muscles and the mechanism necessary to produce a sufficient number of airways in the lungs to supply the body with the oxygen it needs. Gleghorn’s work was recognized this month by Oak Ridge Associated Universities, which awarded him one of its 35 Ralph E. Powe Junior Faculty Enhancement Awards. ORAU is a network of 115 research-oriented schools around the nation. UD, an affiliate of ORAU, will match its $5,000 grant. A total of 134 researchers were nominated. The award will enable additional research and may help scientists find better ways to address congenital birth defects, asthma and other respiratory disorders and diseases. Gleghorn joined the UD faculty last September and now has a lab at the Delaware Technology Park. With a background in mechanical and biomedical engineering, he studies the physical forces that regulate development. Pressure appears to be a critical factor in biological development, Gleghorn says. In this case, the function and expansion of airway branches in the lung are influenced by internal and external pressures. Smooth muscle contractions – both rapid and longer in duration, some limited to small areas and some extending across the entire organ – are essential to the branching process. Gleghorn compares it to squeezing a water balloon, because embryonic lungs are filled with fluid, not air. The developing embryo gets its oxygen from the mother, not by breathing air. Applying pressure to a water balloon forces the balloon to bulge out away from the pressure point. That squeezing force is similar to the way muscles contract, forcing airways to branch out. That branching process, in turn, expands the functional surface area of the lung, increasing the lung's capacity to deliver oxygen. An insufficient network of airways produces difficulty breathing and can be fatal, so better understanding of this process may one day lead to fewer pulmonary problems and save lives. In his lab, Gleghorn has developed ways to study the branching phenomenon, called morphogenesis, using small microfluidic devices that allow him and his students to test how cells respond to changes in pressure over time. The lungs of embryonic mice are placed in a small fluid-filled chamber that mimics the chest cavity in which they would normally develop. It's work measured in micro and nano terms – tiny, tiny, tiny. The lungs are roughly the size of Franklin D. Roosevelt's ear on a dime, Gleghorn said. They are intubated with a glass tube that is half the size of a human hair, through which fluid and pressure may be added and adjusted. Over the course of 72 hours, what started off as a single airway adds many branches, and much more lung capacity. With higher pressures, new branches are added more quickly, he said. Gleghorn is looking at the spatial communication between cells and how the genes and proteins within the cells affect muscle contraction and factor into that branching process. Gleghorn started these studies as a post-doctoral researcher, intrigued by the consistent lung architecture produced from billions of cells. The architecture of the lung airways are remarkably similar within a given species, he said. Human lung trees all look the same as do all mouse lung trees. "But it's not all in the genes," he said. "In this case, we have identified that pressure is also a critical regulator of this process." Gleghorn looks at it from the "self-assembly" perspective. "How does the embryo do it?" he said. "We study the natural processes that the embryo uses and try to mimic those mechanisms in culture models to define new therapeutic approaches for regenerative medicine." He brings extensive training and study to the work, with an undergraduate degree in mechanical engineering from Worcester Polytechnic Institute, a doctorate in biomedical engineering from Cornell University, and postdoctoral work in microfluidics, fluid mechanics and molecular and developmental biology at both Cornell and Princeton. In addition to his lab space at the Delaware Technology Park, Gleghorn uses facilities at the neighboring Delaware Biotechnology Institute. He consults with other UD researchers and collaborates with clinicians at Nemours/A. I. duPont Hospital for Children. "UD has a great biomedical research community with many talented researchers that span across departments and colleges. Our core abilities are developing microfluidic and microfabrication tools to study multicellular populations – tissues and organs,” he said. “There are many people on campus that we are starting to work with that have complementary expertise. I can talk to John Slater [biomedical engineering] or April Kloxin [chemical and biomolecular engineering] about engineering soft materials, Randy Duncan [biological sciences] about biological signaling mechanisms, Abhi Singh [electrical and computer engineering] about computational systems biology, and Carl Schmidt [animal and food sciences] about genomics and bioinformatics. "There are many people at UD who can form these cross-college interdisciplinary teams to attack some of these complex and critically important human health problems." As they gain understanding, new ways of addressing disease, delivering drugs to precise targets, engineering tissues and promoting regenerative medicine may emerge. And kids and their parents may breathe much easier as a result.